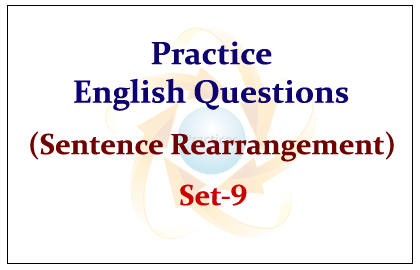 Practice English Questions for upcoming IBPS PO/Clerk and SBI Exams were given below, candidates those who are preparing for the examination can use this questions. 1. First, the value to the reader of discovering what life was like in various ages and countries of old: this kind of intellectual curiosity can in our day be satisfied more fully and more correctly than in any previous age, because of the wonderful work of modern scholarship. 2. It is a relief to escape from our own mechanical age into a world when the craftsman was more and machine less, when imagination was more and science was less. 3. It enlarges the mind and imagination. 4. Nor is this mere hedonistic escapism. 5. We get glimpses of other worlds, human and faulty like ours. 6. I will say a little about these two aspects of history separately. 3. It is a relief to escape from our own mechanical age into a world when the craftsman was more and machine less, when imagination was more and science was less. 5. It enlarges the mind and imagination. 6. We get glimpses of other worlds, human and faulty like ours. 1. Salem looked into the house first, and then they both went in. 2. It was very dark inside. 3. They followed a path and came to an old empty house. 4. In one of the room Ali saw a hole in the floor, with steps leading down. 5. He walked down the steps and came to a small room. 6. Yesterday Ali and Salem went for a walk in the forest. 1. Yesterday Ali and Salem went for a walk in the forest. 3. Salem looked into the house first, and then they both went in. 4. It was very dark inside. 5. In one of the rooms Ali saw a hole in the floor, with steps leading down. 6. He walked down the steps and came to a small room.